down from the ledge...postcards from the edge of suicide: The home that wasn't. After writing just a few short days ago about relative happiness and contentment with my life, I spent most of Sunday bursting into random, unexpected crying jags. 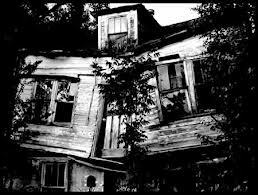 Like an open palm smacking me dead in the chest, the reality of my broken home periodically knocked the wind out of me. Saturday I helped my mom clear things out of the home I grew up in, the same one my dad moved out of six months ago. No matter how old you are, home is home. And you want it there to go back to. You're never old enough to stop wishing it would all work out...somehow. You're never old enough to stop wanting the smell of roast at Sunday dinners, the security of your old bedroom (just in case), the safety of that one place in the world where you belong no matter what. I think about how hard each of my parents worked their whole lives, only to start over at (what should be) retirement age with half of what they had. I think about the seven-year relationship I dragged myself out of, and wondered what kind of strength one has to conjure to close the door on forty years. I think about how lonely it must feel to lose the partner you've had since you were a teenager. Their sadness, though well-hidden, makes me sadder than my own sadness. A divorce is the final decree on the matter of whether you get to have a happy family. Until the decision is handed down, you are free to entertain the fantasy that one day - yes, one day - resentments will be abandoned, bitterness will be overcome, and wrongs will be forgiven. You're free to ponder the unknown because it's still unknown. Until one day it isn't. One day the pre-existing factions within your family quake into full-blown fault lines. The alliances that festered through the years persist long after the dust settles on the end of a marriage, splitting your family into divided loyalties. There was no glamorous affair, no knock-down drag-out fight, just a fading gloom that quietly disappeared into the night. Without a clear-cut reason, I sometimes find myself forgetting why it is they're not together anymore. I wonder if they know, either. When the last box is taped shut and hauled away, you're left standing there with the reality of the situation. What you thought was a broken home reveals itself, instead, to be an empty home. ...and a home that's never going to be -home- again. Sad and lovely post. Maybe one of the things that's kept you from feeling happy before is feeling unable to help those you love feel happier too? I think that's one of the things that often accompanies happiness for me--an awareness of others' unhappiness and despair that I can't do anything about it. Definitely a lifelong struggle, to not be unhappy because of the misery of those around me. What's the saying about, "You can't help someone out of a hole by jumping in there with them." The problem is that happiness=guilt in my family. You are supposed to feel bad about feeling good. Wow this really is a beautiful post. I praise you for coming out so to speak. I've never had the courage. I've had two blogs that developed a following that I had to shut down when I got divorced so then I created this one that I thought you might be interested in http://muldermoveson.blogspot.com/ - I too have written a lot about suicde - especially in my blog that was dedicated my journey in The Overnight. I use FB as a tool to raise awareness about suicide. I've been impacted deeply by my Mother's suicide. Anyway, I love what you write. Thank you. I read through quite a few of your posts, and I could relate to a lot of the struggles with chronic pain, rocky friendships, etc. I hope you keep in touch. Why you should give up hope.